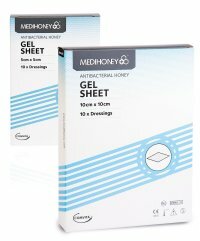 Medihoney Gel Sheet is a sterile, non-adherent wound dressing comprising Medihoney� Antibacterial Honey(80% w/w) and Sodium Alginate for wound care (20% w/w). Directions: Please read the instructions on the packet. Medihoney Antibacterial Honey and Sodium Alginate. There are 10 dressings per box. Do not use on individuals who have had an allergic reaction to honey or sodium alginate. Be sure to read the instructions on the packet before using these gel sheets.